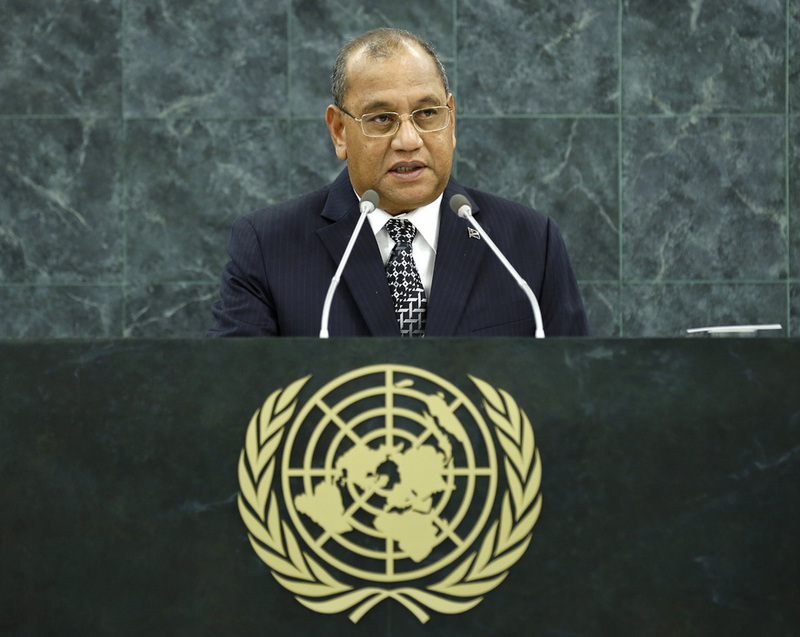 Christopher J. Loeak, President of the Marshall Islands, opened his remarks expressing concern over the fact that the General Assembly “poetic ritual too often buries the true degree of necessary political will”. The two key priorities outlined by the Secretary-General — addressing climate change risks and the growing insecurity within Syria — were falling short. He said that leaders of the Pacific Islands Forum expressed “strong concern at the use of chemical weapons by the Syrian Government”, and called for leadership by Security Council members to stem this threat. The common international voice, however, had come too little and too late and much suffering could have been averted: the tragic human cost of inaction was very high, he added. Turning to climate change, he said that Pacific Islands Forum leaders had adopted this month the Majuro Declaration for Climate Leadership, as the common responsibility to act escaped no Government, irrespective of its size. The Marshall Islands was well on track to achieve solarization of the outer islands with the help of Japanese funds, as well as assistance from the European Union, Taiwan, Italy and France, among others. The whole region had also drastically cut its own emissions through a Pacific energy drive, and he hoped that the message for the world’s large emitters was clear: “If we can do it, so can you,” he added. Climate change required direct political ownership and true statesmanship. It was time for new solutions, he said. Global efforts on climate change were falling short, so he urged world leaders to act not only out of economic convenience, but also out of a common responsibility. The Pacific legacy the Marshall Islands and other regions’ countries had was not as small island States, but the depositories of a “truly global resource”: oceans and fisheries. Local and global impacts affected food security, he reminded. He, therefore, joined other Pacific leaders in urging dedicated treatment of the issue of oceans as a post-2015 United Nations sustainable development goal. Pacific nations were leading the world in changing fisheries, but the responsibility to safeguard fisheries was global. Progress, however, could not be forged through political will alone, he added. The United Nations was already playing a valuable role in working with the Marshall Islands to recover from a climate-driven drought and coastal flooding emergencies. But, more could be done to increase collaboration between the Organization and regional and bilateral partners. Improved progress towards the achievement of the Millennium Development Goals was no less a priority, he continued, and he highlighted the contribution that Taiwan had played in helping the Marshall Islands towards this end. His country also encouraged positive interaction between the two sides of the Taiwan Strait in the international arena. Concluding, he said that he was strongly encouraged by the Secretary-General’s commitment to address the ongoing impacts of nuclear testing in the Pacific, without ignoring, however, the role played by the United Nations during the cold war in authorizing such testing in the region and whose legacy would stay with the Marshall Islands for generations.